"Adventuring? You must be kidding me. That sounds dangerous...not to mention plain unsanitary!" In Era: Lyres, you are Bards, Rogues, and Warriors in the medieval city of Yarnolth. You need to make a living, just like everyone else...But you aren't dumb enough to go fighting Skeletons and Zombies in crypts, or to tangle with Vampires. Instead, you stay in the cities (the bars, mostly! ), entertaining people with stories of your adventures (which are almost certainly completely untrue!). In return, if you provide them an engaging and entertaining evening, they will reward you with gold and glory - all of the perks of adventuring with none of the risk! A lot of money can be made and reputation gained in the City of Yarnolth by the right group working together! 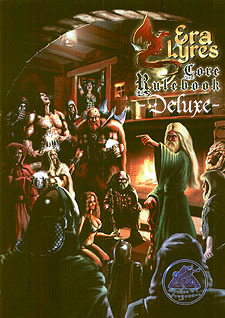 This book contains everything you need to play hundreds of games of Era: Lyres - a guide to character creation and equipment, all of the rules and even sample characters and suggestions for the GM to make things more interesting!